Magnum Guide Service, LLC, an established, respected, and enduring “fulltime” hunting guide service, has been providing serious hunting enthusiasts with some of the finest hunting adventures in North America. 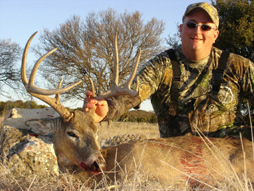 Hunting trips to legendary destinations such as Texas to hunt for trophy whitetail deer, Texas mountain mule deer, free range Texas elk, exotic big game safaris for kudu, sable, wildebeest, gazelle, scimitar horned oryx, gemsbok, addax antelope, mouflon sheep, free range aoudad sheep, and more. Spring & Fall Rio Grande turkey gobbler hunts , Texas predator hunts for; bobcat, coyote, mountain lion, grey fox, red fox, raccoon, ringtail cat, and Texas night time varmint hunts , along with rifle, handgun and archery combination hunts for javelina and feral hogs. Additionally, we offer our guests exciting hunting opportunities to New Mexico’s “Land of Enchantment” for pronghorn antelope. These “prairie speed goats” challenge sportsmen and sportswomen with numerous long range shooting opportunities. Our guest’s tremendously high and consistent success rate on trophy pronghorn antelope is a true “Merit Badge” reflecting one’s expert level of marksmanship and achievement. Through our sister service, JM Adventures.net, sportsmen can book outstanding adventure bound safaris to South Africa for dangerous game; cape buffalo, rhino, elephant, lion, leopard and for plains game species such as; greater kudu, eland, nyala, waterbuck, impala, blesbok, blue wildebeest, black wildebeest, hartebeest, gemsbok, zebra, sable, giraffe, along with bushpig, warthog, hippo and crocodile. If a non-stop, action packed, wing shooting safari is more your style then consider a hunting trip to Argentina. The food and accommodations are superb and our friendly and talented Professional Hunters speak excellent English. Making your trip an exciting, memorable and successful outdoor experience is our number one goal. Our friendly team of honest, experienced, and faithful guides, cooks, and lodge staff, under the leadership of veteran professional guides Jim & Melony Roche, will make every effort to help you bag your trophy of a lifetime while providing the personalized attention you deserve. The familiar smiling faces of loyal repeat customers, along with personalized notes & letters found throughout our entire “Team Magnum” web site, stands firmly as a proven testament and reflection of the exceptionally high level of service each of our “friends” receive. The intensity and level of commitment, combined with the overall integrity of the entire MGS team, help insure each of our guests enjoy a comfortable, safe, and exciting outdoor hunting adventure. Our portfolio of private and historic West Texas, South Texas, and Southwest Texas ranches, alongside our expansive and exclusive New Mexico ranches, offer our guests unique hunting opportunities not always found elsewhere. Our private landholdings with the majority being “free range,” currently surpass 425,000 acres with additional ranch acquisitions annually. All of this helps to insure “Magnum guests” have enjoyable and expanding hunting opportunities. With the security of extensive wildlife management programs, seasoned guides, and dedicated hunters with good marksmanship, our guests consistently maintain a very high success rate while enjoying and preserving the essence and integrity of the “hunt”. For private deer hunting leases, private turkey hunting leases, corporate hunting leases, or private family hunting leases, please give us a call. Each year we have opportunities to put hunters and landowners together. If the thought of having your own private Texas Hunting Lease or New Mexico Hunting Lease appeals to you, then please give us a call and tell us what your looking for in a hunting lease. These hunting ranch leases will vary in size from as small as 500 acres to 60,000 acres. Magnum Wildlife Services is available through us to help protect and manage your leases wildlife, along with maintaining your hunting lease investments.